September 23, 2018, 10:23 PM · No matter how you vote or what you believe, can we at least agree that theme park design and decoration ought to be left to the professionals? 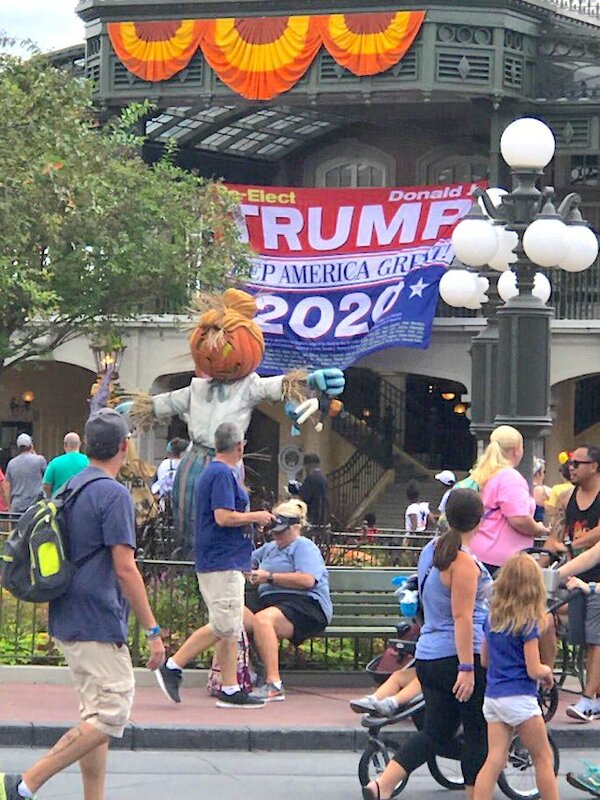 Twitter user disneyjail this afternoon posted a photo from Walt Disney World's Magic Kingdom of a large "Re-Elect Trump" banner that someone apparently had hung from the upper floor of the Main Street train station. Scott Gustin of Tribune Media later tweeted that Magic Kingdom security had the sign down in just over one minute. "The photos from multiple angles make this seem like a much bigger deal than it actually was. It was over before it started. Kudos to MK security for ending it without further incident," he wrote. The incident follows one earlier this month when someone unfurled a similar pro-Trump banner during a curtain call of Disney's "Frozen" on Broadway. In that case, actor Timothy R. Hughes snatched the banner from the stage and threw it aside. Oh, and let's not forget that shouting match inside the Hall of Presidents shortly after the Trump animatronic debuted. Again, politics aside, neither you nor any other theme park visitor can improve upon the work of Disney's theme park design professionals. So leave your banners, signs, placards, and other decorations at home, and let's just enjoy the environment that the park pros have crafted for us, okay? What about free speech? Well, this ain't the place for that. While the U.S. Constitution protects the right to protest in public, the Supreme Court held in the 1976 case Hudgens v. NLRB that the First Amendment does not guarantee free speech on private commercial property. The court upheld that decision in the 1980 case Pruneyard v. Robins, although it ruled that an individual state might grant more permissive free speech rights on private property that is freely open to the public. That case involved a California dispute, which is why you might have seen religious proselytizers sitting at tables in Anaheim's Downtown Disney. But the company's theme parks are not freely open to the public, which gives Disney the right to shut down any protest or unapproved activity inside the park gates. Of course, Disney theme parks' popularity have made them attractive places for protest stunts in the past, most notably the infamous planned Yippie take-over of Tom Sawyer Island in 1970. Hey, if we wanted politics and protest in the parks, we would have voted Pooh for President, right? Yeah, this is a bit much. As noted, it's private property but come on, trying to hang a political banner of any sort is just idiotic. Disney and other parks are about getting away from all that and escaping the world, not more involved in it. If they wanted to do it the right way, promote Trump in Hall of Presidents, which is the non-political approach. Disney is notoriously pro-Democratic party even though such politics has ripped up their plans in pro-Union Anaheim. I get it, Disney and the USA are run by a greedy idiot but there is no need to put the real world into a theme park. I hope the people responsible are band for life from any Disney park or Disney show. Thought for a moment that the scare-crow out front was somehow involved in the demonstration. Then I realized the hair looked too real. This is nothing new. Skywriting religious messages above the parks has been going on for years. Welcome to FloriDUH. Disney might need to put barriers up around the are to prevent idiots from doing such stupid stuff.. NO one ever put up an Obama Poster because they have more respect for private property. Have cameras and throw them out and never allowed to return. stupid is as stupid does sir.. I kind of wish this story had run without the photo -- as this is exactly the sort of publicity the guy wanted to generate. I don’t support political signs at Disney parks or broadway shows, but Disney is partially to blame. The Frozen cast member who publicly said the Frozen show was about inclusion should not have said that, and he should have let security handle the sign, not grab it himself. After those remarks were made, Disney should have made a statement saying the cast member went too far, and everyone is welcome, but political signs or signs of any kind are not tolerated. If Disnsy would have handled the incident at the Frozen show better, I doubt something similar would have happened so soon. Anton M neither of your statements are factually correct. Disney has supported both political parties in order to gain favor but if they are notorious for anything it’s been for supporting Republicans. Also Anahiem has long been known as one of the most conservative, Republican cities in California. The fact that unions have a large presence has to do with having a huge tourist industry. As for “doing it right” how about keeping that out of the parks regardless of your political views? There is a time and place for that but Disney parks is neither. MarkS: You’re fact free. Disney donates 2 to 1 in favor of Democrats. Since 1990, 13 million to Democrats versus 5 million to Republicans. Look it up. Interesting that you call it notorious to donate anything to Republicans. It certainly is a scandal. Most of the time I would agree with you Doug, but this is somewhat of a political thread, and as long as nobody's throwing out insults, we'll be okay as long as everybody acts like an adult when they offer their opinions.